Are you someone who likes to take on a challenge? 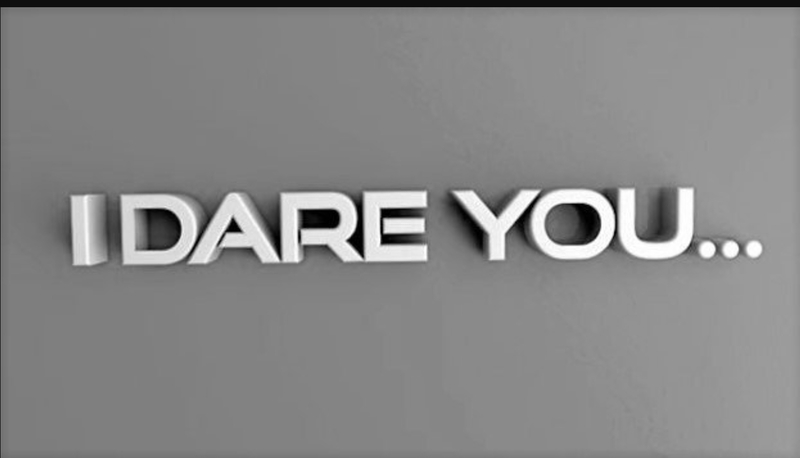 Are you someone who can’t say ‘no’ to a dare? Then you are just the person I want to talk to! In the following paragraph I have a very unique 7 day challenge, or dare if you will, for anyone willing to try. This idea was inspired from one of my favorite books The Power of Your Subconscious Mind by Dr. Joseph Murphy. This book was written in 1962 but is timeless in its wisdom. What I like most about this book is that it reminds us that we do not need to learn any new or secret formulas, we do not need to rely on luck or good fortune, but that the power to change our lives lies literally between our own two ears. The real challenge is learning how to access and harness that power. What you are about to learn is the first very basic steps to doing just that. We have all heard that we use only a small fraction of our brains. (I have heard anywhere between 2 and 10 percent) What this exercise does is allow you to access and make use of some of that hidden potential. It, in essence, puts your mind to work for you. Your brain can be likened to an iceberg. Only the top 10% of an iceberg is what we see sticking out of the water. The bulk of, or remaining 90%, is under water. Same with our mind. Our conscious, or reasoning mind. The one we use on a daily basis to decide what kind of pizza to order is only 10%. Our subconscious mind the one that keeps our heart beating, our immune system working as well as stores all of our memories is the remaining 90%. What we will do here is begin to but that part of our brain to work for us. That is the part of our mind that is active 24/7. It never takes a break, even when we are sleeping. How do we access this amazing storehouse of knowledge? I am going to give you and easy and fun way to do just that. I encourage, dare, challenge or whatever word would get you to try this, to do this for 7 days and astound yourself with the results. One word of caution. The method I am going to give you, which is based on the teachings of Dr Murphy, will seem almost too easy. You must remember, just because something is easy does not mean that it is not effective or powerful. In this case that couldn’t be further than the truth. Give this an honest 7 day effort. Not only will you discover a new powerful force, but you will begin to transform your life! Here is the method. Pick one area of your life that you would like to improve. For these 7 days keep it to just this one area. If we try to do too many at once it is like getting into a taxi cab and giving the driver 6 different sets of directions. Not only will you most likely not get anywhere, you may be kicked out of the cab. So keep it to one area. This could be your job you are unhappy with. Perhaps your financial situation? Is there a relationship that could use some improvement? Actually, it doesn’t even have to be an area that is struggling, but just one you would like to improve. Maybe you love your job, but would like a raise or promotion? You and your spouse love each other but of course there is always room for more love. Trust me, even when I think I am going to explode with love, my Margie finds new ways to bring more love. This works for health challenges as well. Is there a condition you are suffering with? Maybe one you would just like to improve? Ok, now we have picked our one area, here is where the magic begins. Every evening before bed (you can do this first thing in the morning or several other times but always do it right before you sleep) Get yourself in a very relaxed state of mind. Then begin to picture the solution to your area of concern. Do not focus at all on the problem, but solely on the solution. For example, if it is a health challenge you are working on just picture yourself in perfect health and vitality doing what you would be doing. Play a mental movie in your mind. Make it as real as you can. Feel how you would feel, hear yourself talking as you would should the situation be to your liking. If you are seeking a raise, picture your boss coming up to you with a smile, hear his voice congratulating you. When you have got this movie clear and you can really feel as if it were so repeat the following “My subconscious mind is now bringing this into being. I am so grateful to have this in my life. a river of abundant health, wealth and vitality flows through me. It is so” Feel free to tailor that to your specific desire, but affirm it is so and feel good about it. Do this for 7 days and feel free to share the results you have gotten back here to help inspore others. I’ve put Dr. Murphy’s book on my reading list and looking forward to taking you up on your dare! Thank you! I look forward to hearing your results! I pick physical fitness as my seven day focus. I’ll let you know how it goes.